No decision by a military commander engaged in hostilities has more profound consequence than the decision to launch an attack. Pursuant to the law of armed conflict (LOAC), that decision must be based on the judgment that the object of attack – a person, place, or thing - qualifies as a lawful military objective. This judgment almost always sets in motion the application of deadly combat power, and routinely produces loss of life or grievous bodily injury, often times to individuals and property not the intended object of attack, but considered ‘collateral damage.’ In operational terms, this judgment determines whether the nominated target is lawful. 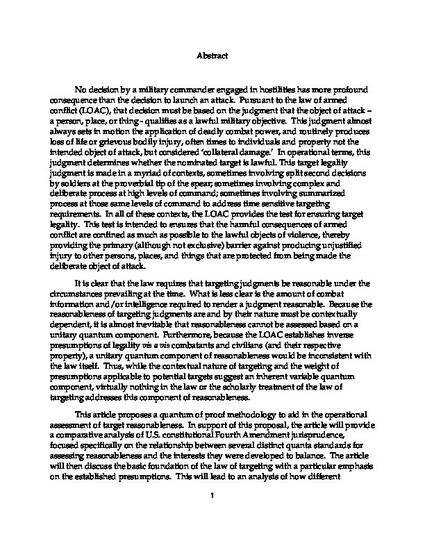 This target legality judgment is made in a myriad of contexts, sometimes involving split second decisions by soldiers at the proverbial tip of the spear; sometimes involving complex and deliberate process at high levels of command; sometimes involving summarized process at those same levels of command to address time sensitive targeting requirements. In all of these contexts, the LOAC provides the test for ensuring target legality.  This test is intended to ensures that the harmful consequences of armed conflict are confined as much as possible to the lawful objects of violence, thereby providing the primary (although not exclusive) barrier against producing unjustified injury to other persons, places, and things that are protected from being made the deliberate object of attack. It is clear that the law requires that targeting judgments be reasonable under the circumstances prevailing at the time. What is less clear is the amount of combat information and/or intelligence required to render a judgment reasonable. Because the reasonableness of targeting judgments are and by their nature must be contextually dependent, it is almost inevitable that reasonableness cannot be assessed based on a unitary quantum component. Furthermore, because the LOAC establishes inverse presumptions of legality vis a vis combatants and civilians (and their respective property), a unitary quantum component of reasonableness would be inconsistent with the law itself. Thus, while the contextual nature of targeting and the weight of presumptions applicable to potential targets suggest an inherent variable quantum component, virtually nothing in the law or the scholarly treatment of the law of targeting addresses this component of reasonableness. This article proposes a quantum of proof methodology to aid in the operational assessment of target reasonableness. In support of this proposal, the article will provide a comparative analysis of U.S. constitutional Fourth Amendment jurisprudence, focused specifically on the relationship between several distinct quanta standards for assessing reasonableness and the interests they were developed to balance. The article will then discuss the basic foundation of the law of targeting with a particular emphasis on the established presumptions. This will lead to an analysis of how different quantum standards established to define reasonableness in the U.S. Fourth Amendment context offer a logical starting point for providing a similar touchstone for assessing the reasonableness of targeting decisions in armed conflict.